Dark Web network protection is an important security measure to prevent data loss, activation and transfer of malware over the Internet. With an exponential increase in activity over the Dark Web over the last 12 months it is crucial that your devices are protected from this new threat. The Dark Web ransomware economy alone is growing by 2,500% annually. The Dark Web is an anonymous network that can only be accessed by browsers such as Tor. By content alone it is larger than the standard indexable Web that we use everyday by about 50% and represents approximately 6% of all sites. In contrast, the standard Web represents approximately 4%. The remaining sites, often referred to as the Deep Web, include non-indexable content managed by private organizations such as governments, corporations and other institutions. The purpose of the Dark Web is to enable anonymous access to content and prevent the identification of both the request and destination. This is achieved by anonymizing all transactions by routing requests through multiple servers across multiple continents before providing the content to the end user. It is commonly used for private communications and is a haven for illegal activity. There are few legitimate reasons to be using this network and it cannot be accessed from a standard web browser. How does BlackFog protect me? BlackFog provides an additional layer of protection on your device by monitoring network packets in real-time and blocking application access to the Dark Web and many other suspicious activities. 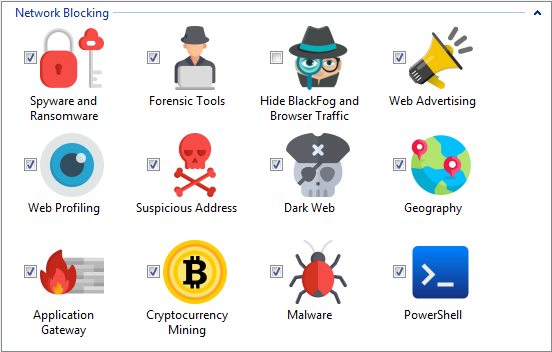 Unlike antivirus software which uses signature based techniques, BlackFog uses multivariant behavioral analysis to prevent attacks and reduce the total surface area exposed to cyber criminals. Dark Web protection is enabled by default in the Network > Blocking options dialog as shown in the dialog below.